As I said in the review, I’ve owned my fair share of crappy headphones that just can’t do the trick the way a high-quality $100 pair can. But sometimes, an inexpensive pair can get a person through some rough times when carrying a bulky pair just isn’t in the cards. And tonight, I bought the cheapest pair I’ve ever owned of physical headphones, from my favorite cheap-o store. Being as how I haven’t written a proper review of anything in a little while, I thought I might break that cycle and lay down the law on that new pair. Simply because they’re not only better than I thought, but that their price led me to believe. My standard cheap-fix store is Daiso Japan, a Japanese chain of ¥100 merch (which is translated as US$1.50) ranging from microwavable rice and Japanese snacks, to wool socks, to dishwashing soap, to even some of my favorite notebooks. They’re constantly cycling out stock, so when I find something there I like, I tend to buy it pretty quickly since after tax it’s rarely more than two bucks. For some items, however, the price is increased. Two and three dollars are the norm for more “high-end” items (though “high-end” is still a bit of a stretch). This would include electronics, and in this case includes a pair of headphones for the surprisingly low cost of US$5. Enter: Daiso-branded Stereo Head Phones (space included because the title seems to imply that). They’re exactly what you expect from a pair of headphones, and little else. Pasticky earphone cups, a hard-plastic band, and a thin four-foot cable. There’s a bit of give around the top of the headband, where some foam and cloth is included to comfort any pressure, and the cups seem to be made of similar cotton material and foam. There’s not much pressure anywhere that I can feel across my ears (as a user wearing glasses), so wearing and listening for extended periods isn’t a bother. I’ve been wearing them for the entirety of writing this article, which should account for something – after a few minutes, other headsets have pressed the corners of my glasses’ arms into the side of my head, and I need to adjust. For a fiver, you shouldn’t expect the pinnacle of sound quality, and that’s still the case here. They really are stereo headphones, or they seem to be through my ears, which is better than I can say for various earbuds I’ve picked up at discount stores that badly try to claim “stereo” when they’re obviously only using one audio channel split for both speakers. This pair has more bass than I expected for the price, while it’s not booming it’s obviously there. And listening to music, instruments are clear without the normal amount of tinny, hollow sound that reminds me of trying to talk through a wire between tin cans in an old children’s movie. The audio quality does still feel dampened though, as though it were filtered through a coffee filter before reaching the eardrum. They’re not even bad-looking, if I’m honest; I didn’t see any other color schemes, but this pair is a basic black with red trim around the cups and detailing around the silver-colored plating that connects to the headband. If I didn’t know better and somebody handed these to me, I’d know they were inexpensive – they’re light and feel more than a little flimsy – but I’d still expect them to be at least ten dollars, double the actual price. 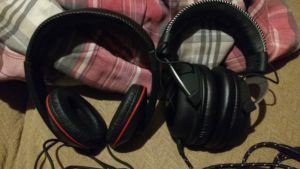 Daiso headphones on the left, HyperX CloudX headphones on the right. 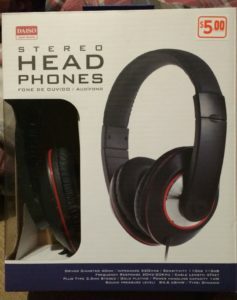 Will these replace my gaming headset? Oh HELL no. The Daiso pair’s cups don’t go over my ears, the sound – while adequate – doesn’t offer the same depth of sound, there isn’t an easy way to reduce the volume independent of the device I’m listening to, they’re not as comfortable overall even with the foam padding under the headband. They’re nowhere near the league of an actual gaming headset. There’s a reason they’re five bucks, after all. But as a back-up pair, these will do the job while I’m crying over any loss of my better headset. Are these a recommended pair then? Yes – if you need headphones in an emergency. Or if you just need a backup pair in case a better pair can’t be used, like they’re left in the back of a cab or you have no more room in a bag and need some audio privacy. Or you just need a pair to have eternally plugged-in somewhere, like a work desk in an office. Really, they’re an assortment of “good enough” – the sound is good enough, the look is good enough, they’re be good enough until you can buy a better pair for everyday use. As a holdover pair they’re perfect, but as a primacy headphone set they’re not quite up-to-snuff. But damn, for five bucks I was surprised, and for that reason alone they’re probably worth checking out for any audiophiles looking for a surprise.